Sign up for Broadjam today to follow QUANTA, and be notified when they upload new stuff or update their news! The long-awaited full-length debut, QUANTA's "Have Moved You" is layered thick with energy and emotion. It's an eclectic yet connected mesh of genres, from the electronic-influenced 'Dicey Neighborhood' to the delta blues influence of 'Sun Means Rain.' QUANTA preserves catchy sing-along choruses set with refreshing maturity. "Dicey Neighborhood" is the leading track off of Have Moved You. It's the most electronically-influenced track, beginning with a body-movin' synth beat. It then gives way to an invigorating Blues Rock chorus. We hope you like it! Why can?t it be mine? That two bit scene, why? "The Show" is a rock song that slips into grooving, funky verses. The lyrics discuss the difficulty of accumulating fans, and just how hard it is to keep the dream of being a rock star alive. Or will this be a lost emote? "A Will" is the first single off of QUANTA's debut CD, Have Moved You. 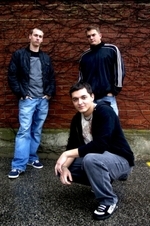 It kicks off with a funky bassline and rockin' beat, and soon to the mix are overdriven guitars and soulful vocals. Listen for the gospel breakdown! "Hero" is QUANTA's fastest song, and it keeps up the energy all the way through, and even builds to a higher level at the end. The breaks in the energy occur when the blues-rock riff comes through, transitioning the chorus to the verse. This is about a person in someone's life who he/she truly looks up to and admires. They do little wrong; they are your "hero". "To Those Who Wrest" is a simple little diddy with light airy chords, a walking bassline, and snare clicks. Although simple, we feel it's effective. What do you think? This song is about getting in a tussle with a loved one. A "rift" is "cut through love", but you're determined and hopeful that you can mend the relationship and be happy together again. 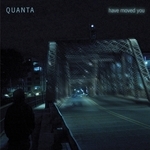 "Have Moved You" is what QUANTA refers to as their "dance song". Being titled what it is, it's important that the song really groove, and QUANTA believes they accomplished that. What do you think? "Niche" is a chugging blues influenced rock song. It just feels like you're groovin' on a train, doesn't it? "Niche" is all about finding your place in this world. You've no need to get scared, you'll find your purpose. We know you'll find your calling! "Through the Night" is all about struggling with love - the ups and downs, the ebb and the flow. And people will be against your love, but you can't let anyone stop you. "Calls Weakening" is QUANTA's hardest song, chock full of energy, slamming guitars, low bass, and in-your-face vocals. "Calls Weakening" has become one of QUANTA's live show staples. "Still, Searching" blends rock with blues, and them some special sauce on top. QUANTA accomplishes something special with this song, building to a frenetic finish. One of their favorites live. This song is about wondering why some terrible things happen to good people. And when something bad happens to you, just think of the millions who don't even know what it's like to eat three times a day. Life needs perspective. "Sun Means Rain" is a blues song written in the Delta style. It is bare bones - just vocals, an acoustic, a snare, and a foot stomp.